In most industries, marketing efforts are vital to obtaining new customers. Advertising, social media, coupons, and other methods are typically applied to increase your pool of new customers. But what role does marketing play in retaining and growing your current customers? Customer marketing is more critical than ever, but it is often overlooked. Focusing on retaining current customers increases sales profitability and at a much lower cost than focusing solely on acquiring new customers. According to Bain & Company, it costs 6-7 times more to acquire a new customer than to retain an existing one; additionally, the likelihood of selling to an existing customer is 60-70% while selling to a new customer succeeds 5-20% of the time¹. Customer satisfaction is incredibly important in retaining customers, whether your focus is B2B or B2C sales. At Red Crow Marketing, we work with both B2B and B2C sales. What we’ve found is that, regardless of industry, customers respond positively when they feel they are heard and appreciated. This translates into retention and growth. If the customer feels ignored or uncared for, they will take their business to your competitors. All the marketing effort and expense you put into making that initial sale is then forfeited if they only use your services once and then find somewhere else to spend their money. 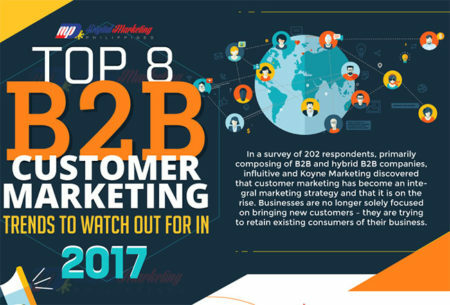 An infographic from HubSpot, an in-bound marketing and sales software company, highlights eight customer marketing trends for this year. The #1 trend is the higher importance of testimonials. Customers are inundated with information and don’t know who to trust, so they rely on their peers to honestly inform them about products and services used. Red Crow Marketing works with our clients to produce powerful customer testimonials, without the awkwardness of trying to extract it themselves from their customers. Not only does this help potential customers in their decision-making (and help you look good), but it gives current customers a way to communicate with your company. Offering feedback makes customers feel more connected to a company or brand and can increase repeat business. Even more importantly, it provides you with a road map to help you improve your product offerings and organizational value. Take a look at the infographic below and see if your company utilizes these other current marketing trends, then contact Red Crow Marketing to ramp up your customer marketing efforts.